For other uses, see Nevis (disambiguation). 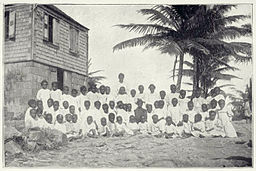 A four-year apprenticeship programme followed the abolishment of slavery on the plantations. In spite of the continued use of the labour force, the Nevisian slave owners were paid over £150,000 in compensation from the British Government for the loss of property, whereas the enslaved families received nothing for 200 years of labour. One of the wealthiest planter families in Nevis, the Pinneys of Montravers Plantation, claimed £36,396 (worth close to £1,800,000 today[when?]) in compensation for the slaves on the family-owned plantations around the Caribbean. The European Commission's Delegation in Barbados and the Eastern Caribbean estimates the annual per capita Gross Domestic Product (GDP) on Nevis to be about 10 percent higher[when?] than on St. Kitts. The major source of revenue for Nevis today[when?] is tourism. 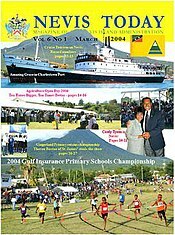 During the 2003–2004 season, approximately 40,000 tourists visited Nevis. A five star hotel (The Four Seasons Resort Nevis, West Indies), four exclusive restored plantation inns, and several smaller hotels, are currently in operation. Larger developments along the west coast have recently[when?] been approved and are in the process of being developed. Two famous Nevisian buildings from the 18th century are Hermitage Plantation, built of lignum vitae wood in 1740, the oldest surviving wooden house still in use in the Caribbean today, and the Bath Hotel, the first hotel in the Caribbean, a luxury hotel and spa built by John Huggins in 1778. The soothing waters of the hotel's hot spring and the lively social life on Nevis attracted many famous Europeans including Antigua-based Admiral Nelson, and Prince William Henry, Duke of Clarence, (future William IV of the United Kingdom), who attended balls and private parties at the Bath Hotel. Today, the building serves as government offices, and there are two outdoor hot-spring bathing spots which were specially constructed in recent years[when?] for public use. Herbermann, Charles, ed. (1913). "Our Lady of the Snow" . Catholic Encyclopedia. New York: Robert Appleton Company. 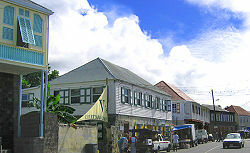 Wikimedia Commons has media related to Nevis. 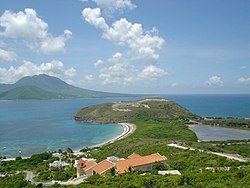 Wikivoyage has a travel guide for Nevis. Wikisource has the text of the 1879 American Cyclopædia article Nevis.